On April 24, a series of purpose pitches and two bench-clearing incidents resulted in suspensions and/or fines for eight uniformed personnel. 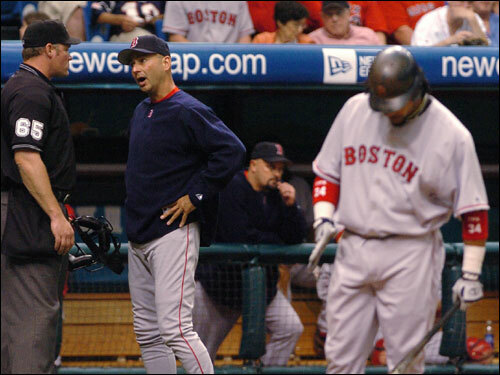 Terry Francona, center, talks with home plate umpire Ted Barrett after Lance Carter threw a pitch behind Manny Ramirez, right, in the top of the seventh. Manny hit the next pitch out of the park.